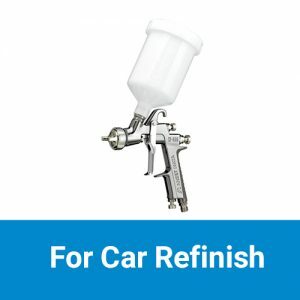 High quality Anest Iwata spray guns for the application of spray materials in the fields of car refinish, woodworking and industrial paint finishing. They are also suitable for airbrushing for all areas of application. They are compatible with a range of compressors, but we advise you check them first before buying. Round Pattern Spray guns works well with most water based fluids or slow drying enamels. 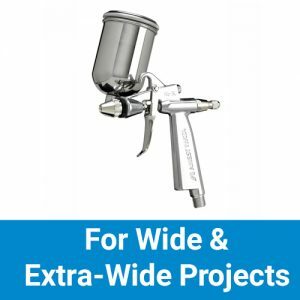 Fan pattern spray guns are best for fast or instant drying paints like automotive paints, where overlapping of paint spray is required to prevent stripping. These spray guns are also suitable for applying spray tanning solutions. Do keep in mind that if you’re using a spray gun for applying tanning solution you will need a higher extraction rate. If you wish to find out more about our spray guns, then don’t hesitate to speak to one of our team on 01423 522836 or contact us via email.